For a dutch text click here. The Dutch Ministry of Finance organized an architecture competition for which a selected group of architectural offices (unstudio, nox, ...) and artists were invited, including myself. 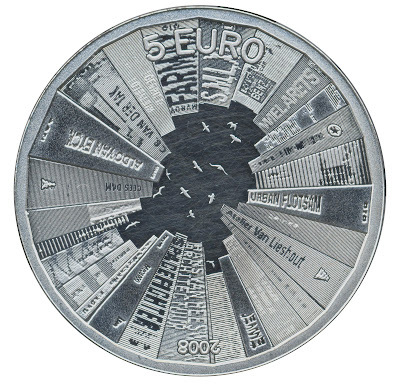 The goal of the competition was not to design a building, but the new 5 euro commemorative coin with the theme 'Netherlands and Architecture'. The winner will be rewarded with a nice price, but most of all with the honor: his design will be realized and will be a legal coin within the Netherlands. I approached the subject 'Netherlands and Architecture' from two points of view. On one hand I paid tribute to the rich Dutch architecture history and on the other hand to the contemporary quality of Dutch architecture. These form also the two sides of my coin. Traditionally the front of the coin needs to portray the queen, while the back side displays the value of the coin. When someone looks closely (click above on picture to enlarge) to my portrait of the queen, it becomes clear that her portrait is constructed with names of important Dutch architects. On the outside the names are clearly readable, while they slowly get smaller to the center. 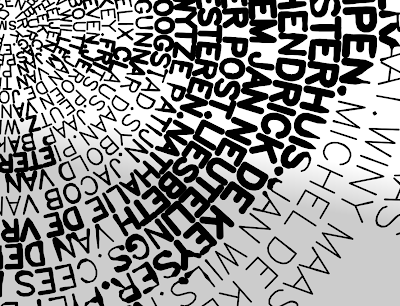 Under a magnifying glass all names are readable, but not with only the human eye. It is fascinating to see how an old medium like a coin can be in this way a 'compact disc' of information. The tension between what is readable and what not, is also a metaphor how time shapes history. Some big names of the past, might be smaller names in the future and vice versa. 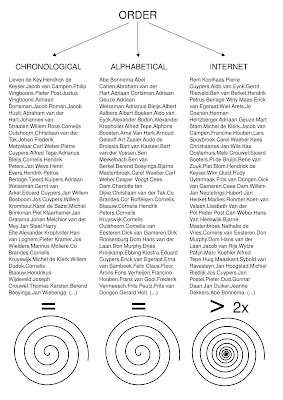 To reflect this idea, I chose to order the architects not alphabetically or chronologically but in a new way: I used the internet as a seismograph and ordered the architects by the number of hits on the internet. Nowadays Dutch architecture is famous for its strong conceptual approach. This translates itself in the fact that there are not only a lot of books about Dutch architects, but also by Dutch architects. The following is the idea sketch for the birds. 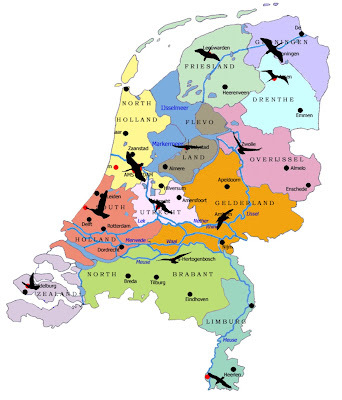 Each bird flies above the capital of each Dutch province. In the final coin these random birds are replaced with a bird which is typical for that province. I am proud to announce that I won the competition! So soon 350.000 Dutch people will use the fruits of free software. I would have loved to release the coin under the GPL, which could maybe solve the financial crisis. However for obvious reasons I was not allowed to do that. There will be also special editions for collectors which can be bought world wide: a massive silver edition for € 30,95 and a massive gold edition for € 194,95. They will be probably sold out quickly as these are real collectors items. 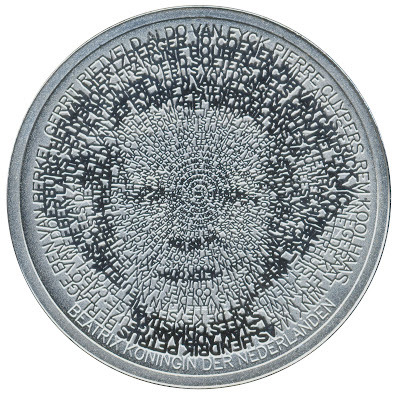 The coin is released in all Dutch post offices to the public the same day as the Intrepid Ibex: 30th October 2008. Well done and congratulations, Stani! Echoing piotr here, "Wow". I subscribe to your feed so that I can get updates regarding SPE and have to confess that I knew absolutely nothing about your professional life. If I had been asked I could not have guessed that are a working artist. That said, I love getting unexpected things in my feeds and this was truly a treat. Reading about the creative process that you used to generate the coin and the levels of symbolism involved was riveting and I can not even begin to imagine a design that could have exceeded yours. While I think it is wonderful you created this with free software, I encourage everyone who reads this to take off their Free Software goggles for a moment and congratulate you on a design that is truly superb. It is a beautiful coin and a fantastic story. Thank you for posting it. Very impressive from both a design and execution standpoint. This is seriously the coolest story of the use of Ubuntu/Debian/Free Software I've ever heard! AWESOME! You should seriously contact the people from Ubuntu Weekly Newsletter, so they can link to your blog. Congratulations on your achievement and thanks for emphasizing the importance of FLOSS on your work. You'd think, with how niche this task seemed to be, that it would require some obscure windows-only software or something.. Heh.. Python FTW! No one in the Netherlands calls their country Holland because north and south Holland are only two of the nation's twelve provinces. EDUCATION! Congratulations, well deserved for such amazing work. Wow, congratulations. I saw this post on planet python's feed, and had to come and leave some comment. Great job, and great post. Wow! Great design with immeasurable amount of detail. Even better, made on Ubuntu. Prachtig gedaan en evenzo prachtig resultaat. Wow, this is very, very, impressive! Schitterend mooi ontwerp. A big step for FREEdom. A nice stunt you pulled of on the Dutch Ubuntu Forum, you little rascal. This is just awesome! I think I have an excuse for going to the Netherlands this year! Amazingly cool, thanks for the great article, Stani! I wonder... Any way to have any part of this on a tshirt? The design and its depth in meaning is really WOW, especially the "bookshelf"! Amazing ! Cheers to your creativity ! btw: you have been stumbled ! Seems to be a incredible art and computer work. I bow down before your skills. Most impressive! I've always thought SPE was excellent, but this is truly awesome. Nice work, fella. Very impressed. 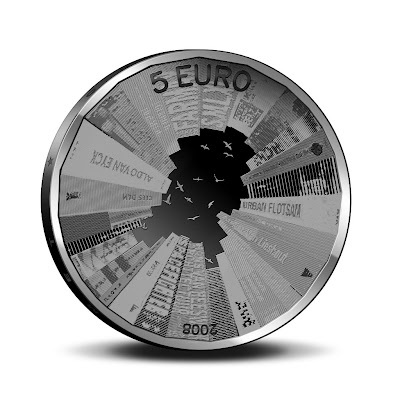 Well .. it will be a Euro coin, right? Inspiring post. Looking froward to using your coin in Ireland. You might also like to know that the Ministry of Finance website runs on free software - specifically Apache Cocoon and HippoCMS, I was a part of the team that built it. truly amazing modern design, and still stands for so much that the casual viewer can understand. great work and my thanks for promoting the open source community, this is a big moment for us. congrats. This is indeed an impressive story. I am inspired! 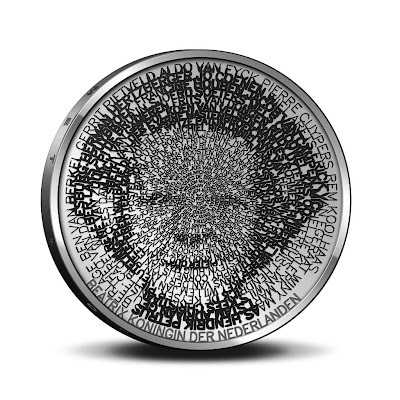 While it doesn't directly help you, or probably open source in general, I have just ordered the Silver and Gold commemorative version of these coins from the Royal Dutch Mint. At least I feel like I have invested in open source in some small way. Plus I liked the design very much. I love how you mixed engineering with art--and sacrificed neither. Awesome! I host a DIY/skills-share programming club at MIT--we call ourselves Social Underground Programming (SUP). We have (small, usually nightly) challenges for fun and learning, and I was thinking that "design your own coin" would be cool one. We'll definitely give it a try. I also wonder whether your code is open source. I think its awesome that you built on top of open source programs and divulged your inspiration and process. I suspect preventing counterfeits must go beyond hiding the code, since the images and eventually real coins are available, so it'd be great to learn from. Goh, Stani, ik herinner me nog twee heel aardige mensen die beretrots op hun zoon waren tijdens de Hardy party in Hasselt. Ik kan me niet anders voorstellen dan dat hun trots nu onmeetbaar moet zijn. Ik vind het gewoon een prachtig ontwerp. Heel bijzonder. Ik moet acuut naar het postkantoor. Saw your blog via the Python planet feed. Beautiful work and congratulations. You deserve every bit of accolades. So... what has this got to do with architecture? Awesome imagination and good crativity... :) u rock buddy. Wow man! God has blessed you with such beautiful creativity and intelligence. Excellent! Amazing! And yet again FOSS shows it's quality and usefulness! Bravo Python! Congratulations! Your coin is beautifull! I'm not sure what you mean by "release the coin under GPL", but I guess you mean releasing the code used to generate the design. Maybe you could at least donate some of your prise money to some Free Software projects that you used to make this coin or just like. Congrats man, a really, really nice looking coin, a true piece of design. Bravo ! How can someone across the ocean (in the US) procure one of these nifty coins? this is so ridiculously cool. my mind is blown, congratulations on your achievement! What makes the dark parts of the coin dark? Especially the country on the back. Or is this a secret of the mint? What wonderfully elaborate ideas. A real marvel of creativity which well deserves the prize. Congratulations! You, sir, are a genius! This is an incredible display of creativity and skill. I have to get one of these coins! This was done with thte python programming language. Read the whole post. Great Job! You can send me one! LOL! I wish the US currency would stop looking like cheap toilet paper, and the coins took on more of that "50 States" Quarter images. Isn't the US currency sad looking? I've lived in Europe for 10 years, and another 10 years in Asia. I've seen the way other countries look at their currency. I guess here we just us our credit cards. THAT is the problem. Congratulatios! That's an amazing story! This is fantastically inspiring! Bravo! Who is the fifth person on the last photo? conceptually, technically, and artisticaly a triumph. fablously well-conceived and executed -- sincere congratulations! "Pavel, Oct 31, 2:52am: Who is the fifth person on the last photo?" Very nice design, I'll try and get one today.. if I still can! Bravo !! I'm speechless . Exceptional design. I cant possibly find good adjectives to describe the elegance of the coin you have designed. Hats off !! Geweldig! Gefeliciteerd. Nu ik dit open-source- en ontwerp-verhaal achter de munt ken, zal ik de munt gaan halen. I am very impressed with the design of the coin, as well as the fact that you used custom software for most of it. 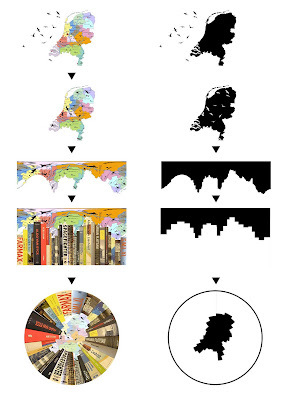 The architecture books on the reverse, made to look like buildings, while also outlining the Netherlands, it all comes together very well. Congratulations. Congratulations! I'm really impressed with the design and the whole creative process. 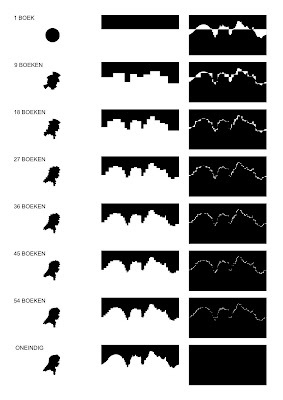 Thank you for the illustrated explanation of the process. I am very impressed! Looking forward to seeing the coin in action. Update: I just went to the postoffice to 'buy' two coins. They're sealed in a credit card size carton. The coins are very nice. The coin is beautiful, physically and conceptually. 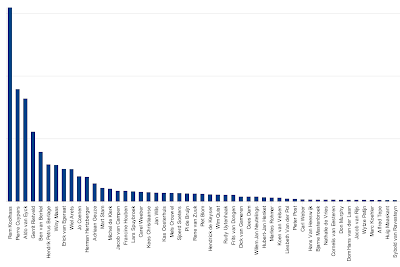 I guess architects popularity also follows Zipf's law. Big congratulations (from france) ! Your work is impressive : the coin is really beautiful (I want one !). and made with python/ubuntu : I want one ! Great story ! Oh no, no accolade to a Python programmer. Nevertheless, be proud, happy and keep up your opus ! Truly amazing - such detail. Congratulations on winning the competition! Applause and emotion from Open Source Publishing. Your stroke font is beautiful. 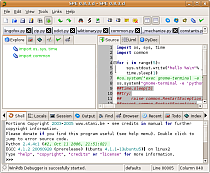 Have you released the code/design somewhere under a free licence? Kudos to you for creating this awesome design, and congratulations with winning the contest - it is well-deserved. Is there anyway i could get a silver one of this? I've checked the coin site. Fortunately i can afford one. Unfortunately there's no way to get it. some dilemma like Android G1 to me i guess. Nice, very nice, not only the coin itself but all the process that lead to it and your explanation how you did it. Awesome. Many congratulations. hi all, and specially Stani, Congratulations for your great work. now just a naughty question, is there any hidden symbol in the design? you know, architects, design, money have a lot to do with massonic symbolism. is there any massonic symbol in your design? here in Portugal we have a beautiful house and garden all designed with symbolic massonic signs, it's called Quinta da Regaleira. Congratulations. This is one of the most brilliant projects I've ever encountered, and your coin design is certainly the best one I've ever seen. That was ingenious and inspired, congratulations, sir. Awesome! Great work and an excellent concept! I'm really moved by your design and the philosophy behind the parts. Thank you for this wonderful creation and for using tools available to us all! Congratulations! That coin is a FANTASTIC design. Beautiful! Amazing in many ways. btw. you forgot to mention Koos Postema (one before rightmost person) in your description.. Very Very Impressive. Amazing creativity and execution. Congratulations for this work of art! wow i really like the book sky line and the queens side of the coin! 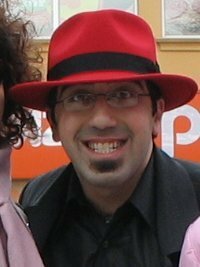 I don't care was you using FOSS or not, because open source software should be of the same quality as commercial and it's the shame that the fact that something was possible to do using open-source software given as some extraordinary fact. But the coin itself and its idea is really great. When I was reading and didn't know that you won, I really wished you that. Wow! amazing work! congratulation for this piece of art. Ha ha wow, I just stared. Congratulations on being awesome. congrats on the prize, but as somebody already explained, do you care to explain the architecture part of the coin? I am really impressed ! Congratulations from France ! More than very well done. It appears that they are willing to ship the normal version of the coin to the UK (and I would assume other European countries) if one goes through the Dutch site, but the postage is €9 which is a bit much but I thought I should mention it anyway in case someone feels like getting one. Absolutely stunning. I would love to see this coin in real-life. Does anyone know of a way to buy the coin for those of us not living in Europe (the US for example)? But I hope you triple checked your Yahoo search results. Carl Weber (39th on your chart) is not an architect, but probably gets confused with Carel Weeber (18th on the chart). Looking forward to seeing the coin in reality. Truly a great job, and it's showing some cool inspiration too. Given Python (and SPE :-) are dutch creations, there's more than one way for you to feel proud. I want two of them!! Wow! You are amazing, I really love the whole concept, very creative and original. Congrats!!! Very inspiring. Free software solutions at it's best performance. Very impressive, both the design and the story! Is the bird for the provincie of Noord-Holland above Amsterdam while Haarlem is de capital of that province? incredible work. i am very interested in getting a hold of this coin too. where can someone from the us get one? I feel like I am reading / viewing something from another dimension or about someone that wasn't born, per se, but somehow created via the intersection, splicing and encoding of the most brilliant parts of the most intelligent and creative individuals of human evolution, a combination of the best artists, the best thinkers and the best coders, et al, all strategically placed into a receptacle in a lab and voila. It blows my mind not just the inspiration and consideration of the concept but it's implementation. Awesome.....!!! !Congratulations for the work. My Passion for python added up reading this.... Great Design and Great Open Source Work. Awesome....! Congratulations. This work added up my Passion for python. Great work and Great inspirational work towards Open Source. this is amazing! congratulations! i'm fascinated! I liked the design, and importantly the way you've described it. A lot of people design wonderful things, but expressing the same is not always easy. Take good care. Wow! ya eres uno de mis idolos!! muchas felicidades, hiciste un trabajo sorprendente! Congratulations on winning the prize and well done for the good work. I was very interested in the description of your thinking for this project, and forwarded this link to my design students to learn from. Outstanding approach and execution. I need one! Amazing!! wonderfull work! I love it and congratulations for the victory! a modern backed by strong and solid concept. i like the metaphor you used about how time shapes history. it was strong. AWESOME!!! Congrats' and thx for the best editor around! I'm fan of your IDE and now of your whole work. Your design hits on so many levels, meeting the requirements of having the royal image while containing potent messages within the text as an integral part of the visual design. That's so great. BTW, the podcast "FLOSS Weekly" on TWIT [TWIT.tv/FLOSS] is looking for Stani for an interview about free and open source software (esp. SPE --big fan here). The contact is Randall Schwartz (merlyn at stonehenge dot com). Check the "Here's what's coming up" link to find Stani's name. Wow this is ingenious, and the fact that it was done with OS tools is awesome! Thanks for sharing the process! That's fantastic Stani! Good to see you still are right up there creating new and interesting stuff! lovely brilliant idea, great execution, well deserved, shall definitely get one! Simply Amazing. You are a design genius. Congratulations from NY via Chicago. I love the complexity of the creative process and how you unfolding the process to us made the coin even more beautiful. Bravo cette piéce de monnaie est magnifique ! This is so cool.... truly inspiring! Congratulations, It's truly impressive and inspiring. Well done! I just saw your post and I was really impressed! It's amazing not only that you made everything with free software but also the incredible imagination and meaning you've put into the coin! Congratulations! Best wishes, It's truly amazing and motivating. Well done! and the point that it was done with OS resources is awesome! Thanks for discussing the process! I am really impressed with the detailing and thought that went into the design of this coin. Hats of to you! Brilliant! 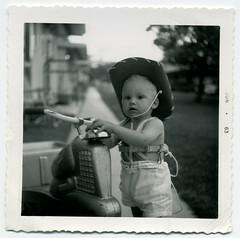 It is so nice to see someone who is great in the logical as well as the creative aspects of life! I felt very happy while reading this site. This was really very informative site for me. I really liked it.Thanks a lot! It has been a couple of years....I'm still impressed by this story. I bought 5 of these coins when it came out. I bought them with the intention of donating them to some of the greatest open source software engineers in the world. Soon I will finally be able to do just that. Thanks for a great design!